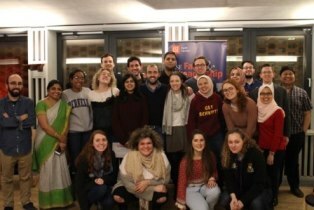 The LSE Faith Centre is delighted to announce that we have been successful in receiving 12-month programme funding from HEFCE (now Office for Students) to create a fully faith-inclusive campus, building on our current programmes of pioneering interfaith work in such a diverse student body. This programme builds on HEFCE funding from catalyst Cohort 1 and 2, and is a cross-School collaboration with the EDI team and Research Division with support from the Volunteer Centre and Students’ Union, feeding into the LSE Strategy 2020 which prioritises a culture of equity, diversity and inclusion in all aspects of campus life. This programme is based on the conviction that to create a cutting-edge example of a faith-inclusive campus we need to take both a reactive and a proactive approach. We want to ensure that students can report issues safely if they arise, whilst also creating a broader culture of curiosity and understanding around faith and belief on campus. We believe all campuses in the UK need to have a more honest and open conversation about how the wider political environment influences the experience of our students. As an outstanding global social science institution which strives to build a culture of respect that welcomes debate and celebrates difference, the LSE is pleased to be at the forefront of these conversations. This funding enables us to do this. expand best practice on interfaith relations on campus and share our research to the wider LSE and beyond. We are proud to be a pioneering religious facility on a global campus with low incidences of hate crime among students and staff, but there is always room to build on this success. We are therefore very grateful to HEFCE for providing the support to expand our capacity, vision and impact in this vital area over the coming year.